We're always keen to hear from experienced or ambitious people who are interested in joining the UK's largest independent construction materials group and one of the fastest-growing companies in our industry. Our culture is rooted in sound business ethics and strong leadership. We have a tradition of commitment to excellence and hard work, constantly challenging ourselves to do better. And we recognise the importance of every colleague’s contribution to the success of our business. We want everyone in our company to succeed and be the best they can be. We want you to feel empowered to perform to the best of your ability. We’ll encourage you to use your initiative, challenge the status quo, draw on your personal skills, helping us continually to change and adapt our business to keep up to date with best practice. In return, we’ll work hard to make sure you feel valued, supported, motivated and rewarded for the difference you make. We’ll give you first-class training, development support and mentoring to ensure you get the best out of your career with us. Where possible, our policy is to promote our existing colleagues to new or vacated positions, so that as our business grows, so do our people. Breedon is an exciting and stimulating place to work, where new ideas are welcomed and personal and team successes are celebrated. From operatives, skilled trades, geologists, quarry managers and engineers, to finance, HR and business development, we all work together as a team to deliver what we’re best known for in the market – outstanding customer service. For more information and to apply online, please see our current vacancies list below. Breedon is an ambitious and fast-growing company. We’re already the largest independent building materials group in the UK – and we have plans to be even bigger and more successful in the future. We have a reputation in the market as a fleet-footed operator, with the highest standards of customer service and a commitment to excellence in everything we do. Although we’re a big business, we’re small enough to care about and support our customers. We’ve developed close relationships with them by being approachable, reliable and able to make quick decisions. We’re always available – and always willing to go the extra mile for the companies who rely on us. We have a simple aim: to be the most profitable company in our industry. We’re achieving this, not by cutting costs, but by investing wisely in our business and our people, by concentrating hard on getting the maximum value out of every tonne of rock we quarry. Our strategy is to grow both organically and by acquisition. We’ve already successfully integrated a number of companies into the group and have many more in our sights. When you join Breedon, you’ll be embarking on an exciting and ambitious journey with us. We adopt values and standards designed to help guide our staff in their conduct and business relationships to ensure that everyone goes home safely every day. We are extremely proud that our safety performance continues to improve year-on-year and we continue to work as a team to aim for zero harm. We’re proud to be able to say that our experienced, professional, honest and reliable team are the best in the business. We don’t believe you’ll find a better group of colleagues anywhere else in our industry. We want every one of our colleagues to succeed and become the best they can be, We offer full training, development and mentoring support and strongly encourage progression. We believe we have a duty of care towards the communities in which we operate. We work closely with them to ensure that our businesses have minimal impact on their environment and well-being – and that we help and support them wherever possible, as responsible corporate citizens. We have lots of different roles at Breedon, from Operations to Logistics and Sales to Finance. Take a look below at some of the roles that we have, and find out what our people think. On a day to day basis my job, like all our Quarry Production Managers, is full of variety with health and safety of all the people on site being the main priority. I spend much of my day out and about with my team, looking at ways to make the site better in every way. I actively make sure the site works efficiently, hitting all of our quality targets to ensure our customers love the product that we send to them. Balancing all the hands on work and getting out and about, I also make sure that the accounts are spot on as well as ordering all of the equipment and supplies needed to keep the quarry running smoothly. I love the work I get involved with on restoration and local liaison, making sure that we are working alongside all of our neighbours. I've had bags of training with Breedon and I know it is a good company to work for as they are committed to seeing people do well. Personally I have received lots of quarry specific training and I have also completed the highly coveted SHE Level 6. Furthermore, I am also qualified to operate most of the mobile plant machinery within the quarry, which allows me to chip in when needed to support the team. I love my job and so many things about it. The absolute highlight of my week is inspecting the field and I'm fairly sure I have the best job in the world when I get to see buzzards, foxes and deer roaming around. I am especially proud of the superb work done over the last 10 years & progress made by the team making Norton Bottoms a great place to work. I started as a ready mixed concrete delivery driver in October 2014 at our Livingston concrete plant. On my first day it felt like I had worked there for years, because of the incredible team spirit and 'can do' attitude and due to the fact that I already knew most of the lads. It was a refreshing change compared to some of the other companies within the industry that I had worked for previously. Fast forward 1½ years and I have been assigned the role of Lead Driver for Scotland which involves assisting our Regional Transport Manager with the day-to-day running of the mixer fleet and drivers in Scotland. I also work closely with our regional distribution office with regards to drivers' hours, truck limitations, truck repairs and maintenance schedules. When I first passed my HGV test 13 years ago, I wanted to gain as much experience on as many different vehicles and within as many industries as I could. I was told at the time by a few people that if I was keen to increase my skills and confidence, I should try concrete mixers as it's a more challenging job than driving a delivery vehicle on the roads. Boy were they bang on the money! New drivers have to learn that driving a mixer truck is unlike driving any other lorry due to the rotating motion of the drum which causes the vehicle to be unstable. The high rotating centre of gravity will pretty quickly have you dropping the load if you don't give it the care and attention needed. I start my day with a vehicle walk around check to ensure the vehicle is safe and roadworthy before I check the day's workload with the Plant Supervisor to confirm loading times and any special instructions. The truck is then loaded with concrete and I deliver it to our customer. Due to the fast-paced nature of the construction industry and the quick hardening properties of concrete, time is a precious commodity and it's something you have very little of during a normal shift. A typical day driving a mixer truck would more often than not involve tight work schedules and long hours. The Scottish weather and the need to wash the truck after each delivery means that it can be quite cold and wet. The thing I like best about my job is working for a company that actually notices the potential in people and offers training opportunities for those who would like to develop themselves within the industry. We have an excellent team of drivers who pull together to complete the task in hand (however long that may take!). The biggest challenge for a mixer driver is trying to maintain a healthy work/life balance, keeping hours to legal limits and maintaining Breedon's high standard of customer service. My most enjoyable day so far was pouring the final turbine base for the Dunbar community wind farm project. There were 19,620m3 turbine bases and almost every day on that particular job we were all maxing our driving hours and were physically and mentally drained due to the adverse weather, road conditions and hours. Finishing the pour on that last day was a feeling of total euphoria for everyone involved on that contract and most of that day was spent high-fiving each other with permanent grins on our faces! 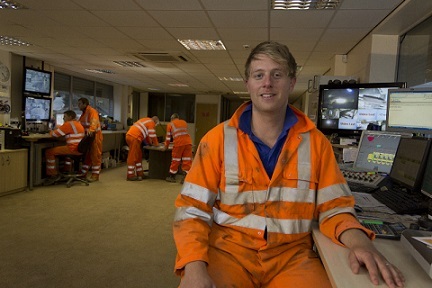 Olly has worked for Breedon since 2011 and now works as a Quarry Supervisor based at Cloud Hill Quarry. Cloud Hill is a very busy, multi product site which means that I have a varied day job, sometimes working on the asphalt plant, sometimes in the quarry and other days batching concrete. I get to operate several different pieces of equipment and drive a variety of mobile plant in our quarries. My day to day role is very varied and incudes working hard to keep everyone on site safe and ensuring the most timely and cost-effective production of aggregates, and efficient utilisation of all crusher and support equipment. I would like to progress with Breedon to become a Quarry Manager and I have therefore just started to study for a foundation degree in Mineral Products Technology at Derby University. I am looking forward to this new challenge, which will allow me to expand my knowledge of quarry engineering, operational practices and management techniques. Breedon funds all my qualifications, provides me with the time to attend university and enables me to have the range of work-based opportunities that I need to apply my learning. My highlight whilst working for Breedon has been passing my Shotfiring qualifications, these are tough qualifications with strict pass marks – it makes me feel really proud of what I can achieve. Anthony is the Plant Supervisor of our busy Llandybie site in West Wales. He joined Breedon in January 2013 and has 7 years of experience of working in our industry. I'm the plant supervisor of our busy ready mixed concrete and screed operation in Llandybie, West Wales. I've been involved in the concrete business for seven years starting out as a company truck driver before becoming a plant supervisor about five and a half years ago. I relocated to Llandybie four years ago. As a plant supervisor, my first responsibility is to work with the team at Llandybie and make sure every task performed on our site is carried out as safely as possible. At the start of each day I go through my site check list to ensure that the concrete plant and the loading shovel are both safe to operate. At Llandybie, I deal directly with customers, providing prices and taking their orders and am responsible for arranging deliveries, in addition to producing the materials which have been ordered. I enjoy dealing directly with our customers, because I’ve found that I can provide a personal touch which they seem to like, judging by the amount of repeat business that we have at Llandybie. When I get a quiet moment, I spend my time ensuring that we have the right amount of materials, such as aggregates and cement, ordered for the next day’s work, carry out any routine maintenance tasks and also ensure that the site is clean and tidy. Safety is so important in our industry, so I ensure that the correct safety procedures are followed and that I speak to anyone that is doing anything unsafe. I’m the trained first aider for the site and maintaining the first aid kit and other safety equipment is an important responsibility for me. I like working for Breedon and enjoy working with a cracking team at Llandybie. I’ve received plenty of training to help me with my job, including completing QCFs (NVQs) in plant and mobile plant, first aid training and I have recently passed an IOSH course. I've been offered some good support and help to people who wish to develop, so you shouldn't be afraid to ask for any opportunities to climb the careers ladder. In my opinion, if you want to be a plant supervisor then good people skills are essential as we need to promote positive customer relations and a good team ethic with fellow colleagues and contractors at the site. It is important that you are flexible and calm under pressure, because it can be a very busy job and things don’t always go to plan! It helps if you are fit because some tasks can be quite physical. Normally you can expect two-stage interviews, sometimes followed by time spent within the department to meet the team. We believe it’s important for you to be as well-informed as possible about what the job involves before we make a decision. In your interviews we’ll focus on your skills, experience and behaviour, so you’ll be asked for examples of how you’ve approached different situations and challenges in the past, drawing on your experience from study, home or work. Make sure your CV is up to date! At Breedon, we embrace the fact that everyone is different and we recognise the contribution that each person can make to achieve our shared goal. We strongly believe that the best way to engage great people is to create a working environment based on trust and respect, and we are therefore committed to being an equal opportunities employer. We are dedicated to ensuring fairness of treatment, dignity, work-life balance and the elimination of all forms of discrimination in the workplace for all of our colleagues and job applicants. We aim to create a working environment in which all individuals are able to make best use of their skills, free from discrimination or harassment, and in which all decisions are based on merit. It is our ambition that all colleagues are able to contribute fully to the success of Breedon. We strive to create an environment where every individual can flourish and colleagues feel empowered to use their strengths, talents and competency whilst understanding how they can get fully involved in all aspects of the business. All colleagues are encouraged and supported to develop, using a range of methods including formal training using internal and external providers, coaching and mentoring and on the job experiences. Development is identified through our One2One process. At Breedon we want our people to be at the top of their game, giving world class performances every day and enjoying their time at work. As a result, we firmly believe that learning and development will truly support our ambitions. Kick start your career at Breedon - your best days are ahead of you! An Apprenticeship with Breedon will give you real practical experiences, a good salary and formal qualifications. We are an experienced employer providing high quality Apprenticeships, helping you to really kick start your career. Apprenticeships at Breedon offer a flexible development path across the business, developing competent, motivated and talented people. In addition to your qualifications and on the job training, we offer you a range of personal development, ranging from communication skills and team working to safe driving. We will give you an opportunity to train in a practical way accessing the trade which interests you the most. All practical training will be at one of our UK sites combined with a local college providing formal learning and qualifications. We offer a structured training plan, supported by our experienced mentors, helping you to master your chosen trade. We offer a choice of Mechanical Apprenticeships and Electrical/Electronic Apprenticeships, both of which are a 4 year programme gaining higher qualifications HNC and NVQ 3 or a Vehicle Repair Apprenticeships which is a 3 year programme gaining higher qualifications HNC and NVQ 3. We give you the chance to learn about our industry whilst gaining a Foundation degree. This is a 3 year programme whereby you will gain a Higher Apprenticeship in Mineral Products Technology and NVQ 4. Your first year is spent understanding our business, covering aggregates, concrete, asphalt and cement which complements your first year of distance learning at the University of Derby. Your second and third years are spent specialising to provide you in-depth learning opportunities and to deliver meaningful projects across our business. You must be willing and able to relocate at any stage before, during and after the three year programme. As a complement to our Engineering and Operational Apprenticeships, we also offer Business Apprenticeships, which offers you an opportunity to work within our administrative functions where we are then able to offer secondments into various functions within our business including Finance, Commercial and Logistics, etc. It is a one year programme gaining you an Apprenticeship in Business Administration Technology and NVQ 2. The great thing about our Apprenticeships is that your learning can continue after your Apprenticeship is completed. We offer ongoing education up to degree level and beyond for people who work hard, make the grade and contribute fully to our business. Think our Apprenticeships sound like they might be up your street? If you need convincing a bit further, why not have a look at what some of our current apprentices think. Connor is one of our Mechanical Electrical Apprentices at Raisby Quarry in Durham and joined us in September 2015. Now that I am into the second year of my apprenticeship, I can’t believe how far I’ve come and how much I have learnt over the past year or so. I am learning more and more new things at work every day and constantly overcoming new challenges. In addition, I am being tasked with more personal projects which I am finding increasingly more difficult the further I progress. But I do thrive off learning new things and I am always finding myself putting the new skills I have gained into practice. I feel that being an apprentice really develops you as a person; I am able to work using my own initiative and perform more jobs independently, as well as working with new people. Breedon is a fantastic company to work for! They really look after and appreciate their apprentices. So far, I have received several opportunities to work with different people such as the concrete fitter, where I was lucky to experience how the concrete plants work and the sort of maintenance that is performed. Another example is the week I spent recently at the cement works which allowed me not only to work with a team of fitters at a different site, but also to work as part of a team with the other Fitter Apprentices. I really like opportunities such as these because it allows you to work in teams with other people, share ideas and learn new ways of completing tasks you would normally do at work or experience putting new skills into practice together. Breedon acknowledge hard work and commitment and really show their appreciation. 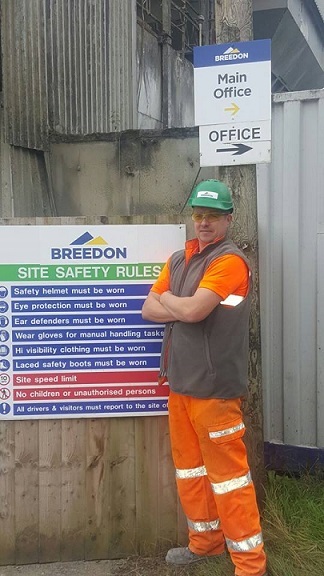 At Breedon, I am constantly meeting new people on site and getting to know them and so far everyone I’ve met has been very friendly and willing to offer a helping hand if needed which is absolutely great. To me, this is a very important factor at work as it makes you appreciate where you work more and feel more at home during your working day. So far the fitters I work with on a day-to-day basis (quarry fitters and concrete plant fitter) are a pleasure to work with; they really appreciate any help I can give to them and are always happy and willing to teach me new skills and give me ‘on the job’ training. Also, I always feel comfortable if I have to ask anyone for help at my place of work which I think is really important. My proudest moment so far is seeing how far I have progressed since starting my apprenticeship. Within my first year I won the TWI Apprentice of the Year Award which was an amazing feeling and made me feel very proud. It gave me a great sense of achievement and the bonus was when my company congratulated me personally and presented me with a ‘rising star’ award. But further to this, it is also fantastic that I have had the opportunity to take part in yet another award. These opportunities do not come along too often so I will always do the best that I can. 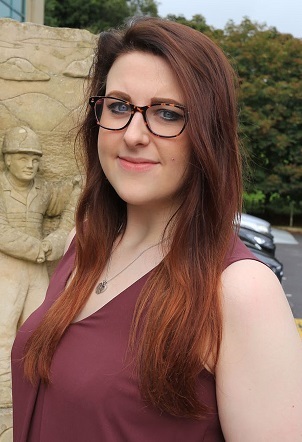 Jess is one of our newest Business Administration apprentices at Hope Cement Works in Derbyshire, and joined us in September 2016. When I was offered the role of commercial apprentice I was ecstatic and really proud. I had worked hard to prepare for all the meetings as it is something that I really wanted to do. 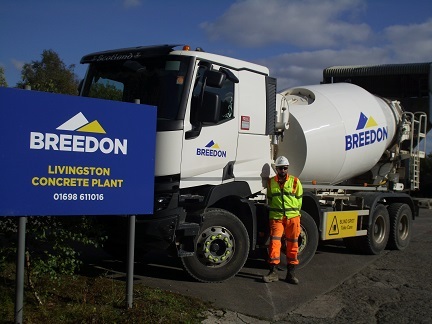 This also helped for me to have a further understanding about Breedon Cement and learn about the place in which I would be working. Initially I was attracted to the role for the business development opportunities, that Emma (now my company mentor) told me about when she visited our school. After spending more time speaking to Emma and completing my own research into the company, I became enthused about working for the company as it seems to really value its employees and give them great advancement opportunities. This is done by ensuring that at all times we are happy and comfortable within the workplace, which makes you feel relaxed and confident to work hard at your job. There are so many activities that you can get involved in, which allows you to connect with other members of the team within the business and also allows you to spend personal time doing activities that can benefit yourself. Within the business, there are always opportunities to increase your knowledge and skills to allow you to have a better knowledge and understanding and to help you within your own job role. I chose an apprenticeship as I did not feel that university was the right choice for me. This particular apprenticeship allows me to develop my career in the direction I want to go whilst earning money. Even though I am not going to university, I am still able to gain further qualifications by attending college which, by the company and the college working closely together, has been tailored to suit what I need to get to help me progress within my own personal career. 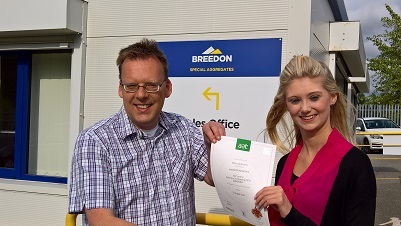 Becca joined Breedon as a Business Administration apprentice in 2011. Although she has now completed her apprenticeship, she is now a vital part of the team and has gone on to study further with our support. Whilst at work and college I had to build a portfolio of evidence for each separate unit with support and feedback from my assessor. Action plans were also drawn up to help me collect the right type of evidence so that when my assessor came out, work assessments took place to show how my job role fitted within each topic. My performance was observed and I also had to show them the evidence I had collected. During each of their visits, my assessor and I agreed and recorded an action plan and they also provided me with written feedback. At college, I had to write personal statements for each unit to say how I met the learning outcomes and evidence requirements. I also had to carry out professional discussions. Once I had left school, I knew straight the way it was an apprenticeship I wanted. I really enjoyed being an apprentice because it allowed me to have a full time job and to gain a qualification at the same time. 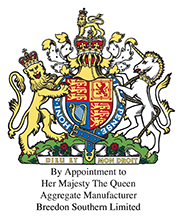 Since completing my apprenticeship with Breedon they have allowed me to take my education further. I have now completed my AAT Certificate in Accounting Level 2, AAT Diploma in Accounting Level 3 and I have just started AAT Diploma Level 4. I have had a lot of support from Breedon and I’m very grateful they have enabled me to progress further. My proudest moment up to now is how far I have progressed since starting with Breedon in 2011 and starting my AAT Diploma Level 4. 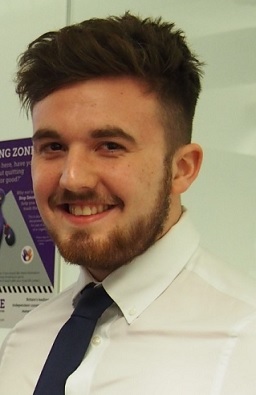 James joined Breedon as an Electrical Apprentice in 2013. I have worked for Breedon for 3 years now, at Cloud Hill Quarry in the East Midlands. 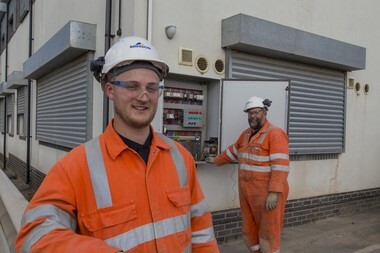 My Grandad, who also works here, found out about the apprenticeship programme and suggested it would be a good opportunity for me to start my career as an Electrical Apprentice. I am currently in my fourth year of my apprenticeship and I am now halfway through my HNC studies. I am enjoying this opportunity and am interested in electrical engineering – so the course really complements my career ambitions. I enjoy being busy, learning new things, being hands on and getting actively involved with everything that is happening, so the Breedon apprenticeship programme has been a really great opportunity for me. We are delighted to be able to offer internships and work experience placements, where we can, to anyone who is interested in finding out more about working at Breedon. Have a look below at what our most recent placements have offered. Andrew spent two weeks with the Breedon Geology team in August 2016. During my two weeks with Breedon, I shadowed the geology team where I was involved in verifying mineral volumes at new sites, exploring options for extending existing possessions and generally getting a feel for how an aggregates company operates. I became familiar with QGIS software through creating maps with overlain borehole data, making it instantly and intuitively clear where mineral is and giving an idea of the quality of the deposit spatially. 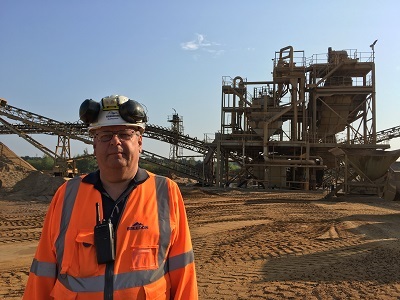 I visited a variety of quarries as well as a concrete plant and the cement works in the Peak District during my fortnight with Breedon and gained an understanding of how each operates. The cement works in particular was a fascinating place; I was surprised to see the efficiency in the whole operation with the raw shale and limestone being quarried effectively on site and being converted into ready-to-use cement so locally. The digital regulating of the various inputs to produce cement within certain tolerances was truly impressive, as was the level of analysis at all stages of production. I thoroughly enjoyed going into the limestone quarry at Castleton, watching a blast and then being able to go and pick up pieces from the debris pile that had not been exposed since they were deposited in the Carboniferous. 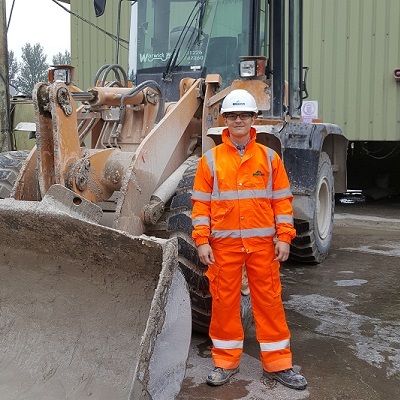 Sonia is currently studying for her GCSEs and spent her two weeks' work experience with us at Cloud Hill Quarry in the East Midlands. I spent most of my time at Cloud Hill Quarry but also at the main office in Breedon on the Hill, where I got to spend time with many of the key departments and working with experienced staff who carry out the work on a day to day basis. I mostly observed work being done however I was also able to see first-hand how things work and the issues which needed to be dealt with to ensure everything is done properly. I was really keen to understand how all of the various jobs come together to make the whole Breedon business work. I was given the opportunity to spend time in each department, seeing what they did and how they worked alongside the other departments to ensure that customers got the products they ordered when they wanted it and that, most of all, everyone was kept safe. Want to come and have a go? Email us at careers@breedongroup.com telling us what you're looking for and where you're based, along with a copy of your CV. At Breedon we’re always on the lookout for new talent…. Whether you’ve recently graduated or spent a few years in work and are ready to forge your career with a leading national construction materials group, we’d really like to hear from you. We offer challenging opportunities in a variety of disciplines, including Operations Management, Finance, Technical, Surveying and Engineering. As a graduate trainee, you’ll spend most of your time in the business experiencing a mix of practical, hands-on learning, supported by technical and academic study to ensure you have the right skills for your future career. Your structured development programme will last a minimum of 12 months and involve both on- and off-the-job training, with the opportunity to progress towards a specific role or discipline in our organisation. We have opportunities nationwide for talented individuals with skills or experience in Drilling, Mining, Project Management, Operations, Exploration, Aggregates, Minerals, Excavation and Health & Safety. You must be degree-qualified with a minimum 2:1 Hons in a related subject such as Geology, Engineering or Business Management. We offer a number of Placement and Internship opportunities each year. Our placements are a great way for you to get a flavour of what working in the Breedon team is all about. Typically, they are 12 to 15 months in duration, usually in the third year of a four-year degree. We have opportunities in all areas of our business. Our internships give you an opportunity to discover what working in a particular role is like and to gain the essential real-life experience that’s highly sought-after by employers. A Breedon Group internship can last anywhere from a couple of weeks to nine months. To apply, please email a copy of your CV and a covering letter detailing your preferred geographical location to careers@breedongroup.com.